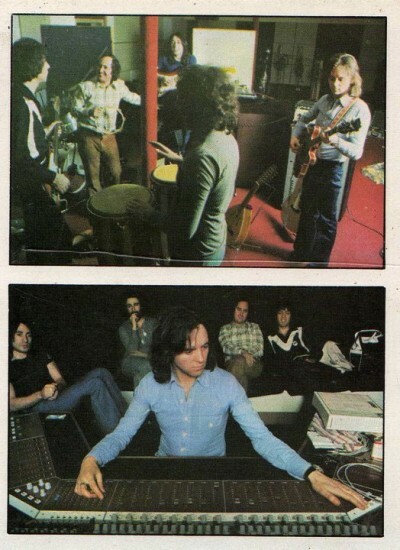 From the sleeve of Neil Sedaka's 1973 album 'The Tra La Days Are Over', photos of Neil and 10cc in Strawberry Studios (Eric Stewart is mixing a track on the bottom photo). This was the second album that Sedaka recorded with 10cc at Strawberry (the first was 'Solitaire in 1972) and both resurrected a career which had stalled in the mid-1960s. It was also after the Solitaire album that the four Strawberry session musicians got together and decided to make a name for themselves......as 10cc! Graham Gouldman said in 1984, "It was Neil Sedaka's success that did it, I think. We'd just been accepting any job we were offered and were getting really frustrated. We knew that we were worth more than that, but it needed something to prod us into facing that. We were a bit choked to think that we'd done the whole of Neil's first album with him just for flat session fees when we could have been recording our own material"
Sedaka was quick to praise his backing musicians at the time; ""I dig them, they dig me. I find them the most remarkable musicians I've ever worked with, and they are playing again with me on my new album The Tra-La Days Are Over. I think they're the next Beatles. I've just heard their forthcoming album. I was totally knocked out. They, I feel, have achieved what David Bowie and Lou Reed have tried to achieve. Futuristic. Fresh things. New things. Electronic noise, good guitar work, lyrics that are not predictable. Yes, futuristic."